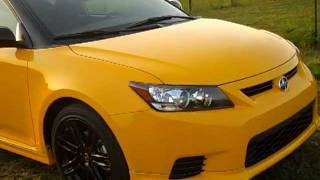 Painted in High voltage yellow color, the Scion tC RS 7.0 2012 will be available at the Scion dealers this summer. The 2012 tC Sports coupe will come standard with a new Pioneer™ audio system that features Bluetooth® hands-free, Bluetooth® streaming audio and HD Radio™ technology. The tC RS 7.0 also features Smart Key, a convenient keyless entry system that unlocks the doors with a touch of the door handle. The system also includes a red TRD push-button start allowing the car to be started with the push of a button. The use of the Smart Key system is a first for Scion. TORRANCE, Calif., June 28, 2011 -- Scion announced today that its first release series for the second generation tC sports coupe, the 2012 tC Release Series 7.0 (tC RS 7.0), will be available at dealer showrooms this summer. Scion is also pleased to announce that the 2012 tC sports coupe will come standard with a new Pioneer™ audio system that features Bluetooth® hands-free, Bluetooth® streaming audio and HD Radio™ technology. The 2012 tC Release Series 7.0 comes exclusively in High Voltage yellow exterior paint with contrasting black side view mirrors and black 18-inch alloy wheels. 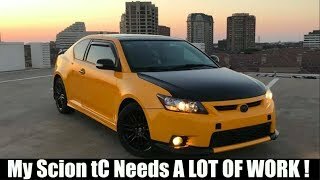 The tC’s aggressive exterior are further stylized with a TRD body kit that includes front and rear lower valences and side skirts. The front bumper incorporates a honeycomb lower grille that is unique to this Release Series. High Voltage yellow accents make their way into the tC’s interior with color-tuned black and yellow seat fabric, leather wrapped steering wheel with yellow stitching and an individually numbered badge. The tC RS 7.0 features Smart Key, a convenient keyless entry system that unlocks the doors with a touch of the door handle. The system also includes a red TRD push-button start allowing the car to be started with the push of a button. The use of the Smart Key system is a first for Scion. Scion will only build 2,200 units of the tC RS 7.0. The limited edition model will carry a manufacturer’s suggested retail price (MSRP) of $20,905 and $21,905 when equipped with a manual and automatic transmission respectively. The MSRP does not include a delivery, processing and handling fee of $720. The launch of the tC RS 7.0 will be launched with a new advertising campaign, starring a very lighthearted Zeus on his Mount Olympus throne, who describes himself as the God of Awesome -- and then creates the High Voltage tC using his legendary lightning bolt. 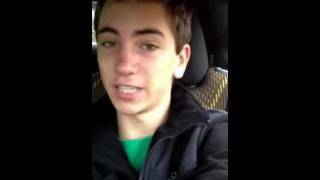 With the help of a lovely Muse, Zeus has a great time driving the tC and highlighting its features. maximum output Pioneer™ audio system. New standard features for 2012 include Bluetooth® connectivity that allows both hands-free phone connection and streaming audio capability as well as HD Radio™ technology Streaming audio allows compatible phone or personal media devices to pair with the audio system and listen to music through the vehicles sound system. The audio system also features an organic electroluminescent (OEL) screen with a personalized welcome screen, iPod®/USB connectivity, Advanced Sound Retriever (ASR), and a subwoofer RCA output. The USB port and universal auxiliary (AUX) port are located on the center console that allows users to listen to their portable music collection through the tC’s eight Pioneer speakers. Connectivity is achieved by simply plugging the portable music player, including iPod® and iPhone®, into the USB or AUX port. The head unit’s screen displays track number, track name and artist information from select USB units. The audio system provides outstanding sound quality through the car’s stereo system and constant power to select iPods®. Music is controlled through the head unit and the steering wheel audio control buttons for radio, CD and certain USB devices. iPod® users can also use an alphabetical speed search to find a specific artist or album. The ASR function restores a wide, deep and rich quality to MP3/WMA/AAC sound. Through the subwoofer RCA output, tC owners can add an external amp to drive one or more subwoofers. For easy operation, the system’s multi selector allows for easy control of the head unit. Unique to the standard Pioneer audio system is the customizable welcome screen that also lets users to create a personal message of up to 16 characters. The optional 340-watt maximum output Pioneer™ Premium audio system has the same features as the standard Pioneer audio, but is enhanced with a 5.8-inch LCD touch-screen display, features iTunes® tagging and Pandora® internet radio connected through iPhone® and six RCA outputs to add external amplifiers. Both the standard and premium head units retain key Scion audio system features such as Scion Sound Processing® (SSP) where listeners can choose from three pre-set equalizer settings, satellite radio compatibility and MP3 and WMA capability. In addition both units adjust the volume control based on driving speed. The base MSRP for the 2012 tC equipped with a six-speed manual transmission is $18,575, and $19,575 when equipped with a six-speed automatic transmission. The delivery, processing and handling (DPH) fee for all Scion models is $720 and is not included in the MSRP. DPH fee for vehicles distributed by Southeast Toyota (SET) and Gulf States Toyota (GST) may vary.